The Centro Financiero Confinanzas is a tower in downtown Caracas, nicknamed Torre de David after David Brillembourg, the tower's main investor who died from cancer in 1993. During the banking crisis of 1994, the government took control of the building and it is still unfinished, lacking lifts, installed electricity, running water, balcony railing, windows and many internal walls. In 2001, the Venezuelan government made an attempt to auction off the complex, though no one made an offer. 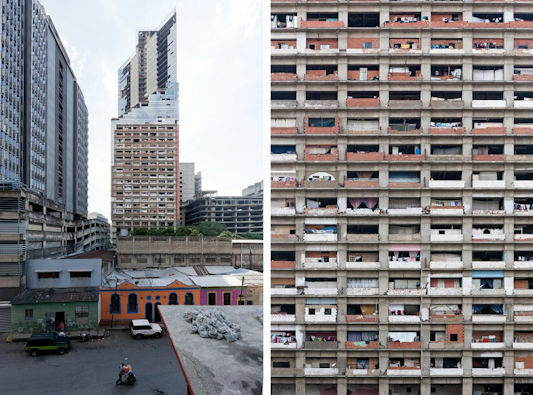 In the 2000s and 2010s, Caracas suffered from a housing shortage, which led to the occupation of the complex by squatters led by ex-convicts in October 2007, with over 200 families, representing about 40% of Caracas' "informal communities", taking over the centre. Residents improvised basic utility services, with water reaching all the way up to the 22nd floor. They could use motorcycles to travel up and down the first 10 floors, but had to use the stairs for the remaining levels. The residents lived up to the 28th floor, with many bodegas and even an unlicensed dentist also operating in the building. The population grew to seven hundred families made of over 2,500 residents living in the tower by 2011 and had a peak population of 5,000 squatters. In 2014, the Venezuelan government started to rehouse the squatters and by June 2015, all of the residents were relocated to their new homes. In July 2014, it was reported that Chinese banks were interested in buying the tower and renovating it for its original use but this later fell through. The tower is stll not in use. Thanks to James Coulter for pointing me to this bulding.